Inga Readus poses in her apartment the day before Thanksgiving. Readus received help from the Times Free Press Neediest Cases Fund earlier this year. She did not feel safe in her previous apartment, so the fund provided $600 for her first month's rent in a safer area. Inga Readus barely left her apartment when she lived at College Hill Courts earlier this year for fear of her safety after experiencing a string of bad events. Shortly before Christmas in 2017 and right after she had surgery, Readus' car was stolen from her parking spot at the Chattanooga Housing Authority complex. Then, earlier this summer, a woman was shot after a "drug deal gone wrong" right in front of Readus' door, she said. "I rarely came outside unless it was to go to work," the 49-year-old said. "After the shooting, I just didn't feel comfortable." 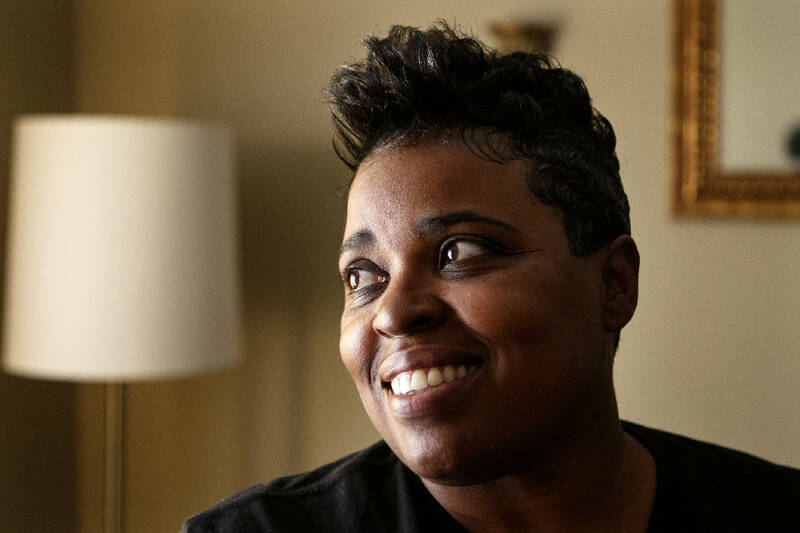 Readus decided it was time to move out, but with a car payment, rent and insurance, it was going to be difficult to save enough money to pay her first month's rent in another apartment. Thanks to a tip from her employer at the time, the Partnership for Families, Children and Adults, Readus received help from the Times Free Press Neediest Cases Fund. This past year, Readus — now a caregiver for ArkRidge Home Care — received $600 from the fund to help pay her first month's rent at her new home, the Dodson Avenue Apartments. Readers who contribute to the Neediest Cases fund over the next month will be acknowledged in every Sunday edition of the Times Free Press beginning Dec. 2. "I'm very, very glad," Readus said, sitting on the couch in her new apartment she shares with her boyfriend. On her table was a red velvet cake ready to be served for the 10 family members coming over the next day for Thanksgiving. To the right of her was a wooden frame sitting on an end table that read, "Grandkids make life grand." To the other side of her was a framed photo of her 30-year-old daughter, Katilya, when she was a baby and a photo of Katilya's 8-year-old daughter, Jordan, when she also was just a baby. With thrift-store finds and pictures of her loved ones, she has made her new apartment feel like home in the past five months. Not being able to afford a first month's rent or a security deposit to move into a new home is a common need for recipients of the Neediest Cases Fund. According to figures provided by the United Way, 54 percent of people who received help from the fund in 2018 needed assistance with their rent or mortgage. In 2011, only 19 percent needed help with housing assistance. In 2011, the greatest need was for assistance with electric bills at 59 percent. In 2018, just 22 percent needed help with their electric bills. Carmen Hutson, director of stability and community programming at United Way, said that today there are more organizations offering assistance with utility bills, including the Tennessee Low Income Home Energy Assistance Program, Power Share and other programs. It doesn't surprise Martina Guilfoil, president and CEO of Chattanooga Neighborhood Enterprise, to see the demand for mortgage and rent assistance increase. She said rents have increased 13.2 percent while incomes have remained stagnant. CNE is a nonprofit housing organization in the city. "Many low-income homeowners faced an increase in their tax bill when the new property tax assessments came out this year," Guilfoil explained. "In addition, much of Chattanooga's old housing stock is not energy efficient." Guilfoil said many households have a choice to make: pay their rent/mortgage or electric bill. "There often isn't money to do both," she said. "For households living on a fixed or low income, even a small increase in rent or a utility bill can send them into a financial tailspin." To donate to the Neediest Cases Fund, visit https://app.mobilecause.com/form/hsLJtw.